Provides your sensitive skin with unequaled softness day after day. More than a gesture of hygiene, a daily appeasement. Respect the sensitivity and comfort of skin prone to redness. Instantly and durably soothes Irritation and Pulling Sensations. Rich in Avene Thermal Water, soothing and anti-irritant, it allows the skin to regain calming, comfort, suppleness, and softness. Morning and evening, gently apply the Milk Dermo-Cleansing Antirougents with a cotton pad or fingertips by light circular massage. 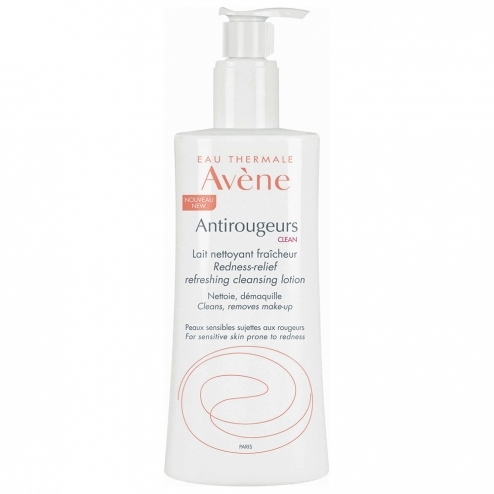 INCI formula: Avene thermal spring water (avene aqua). C12-15 alkyl benzoate. Caprylic / capric triglyceride. Poloxamer 188. 4-t-butylcyclohexanol. Acrylates / c10-30 alkyl acrylate crosspolymer. Benzoic acid. C12-20 alkyl glucoside. C14-22 alcohols. Carbomer. Chlorphenesin. Disodium edta. Octyldodecanol. Pongamia glabra seed oil. Sodium hydroxide.